Soccer Mommy isn’t just influenced by pop music, the fast-rising music star also brings in catchy elements and lyrics in her songs in a bid to be creative and unique. Unlike most people in the music industry, especially those who do lo-fi music and rock indie, Mommy is relatively new and stands a chance of replacing old and shaky voices in the nearest future. 2015 was a defining year for the singer-songwriter. Remarkably, it was the period she saw the need to sell her craft in the highly competitive music industry. And so far, she has been nothing short of stunning, to say the least. Besides working with several artists and music bands, Soccer also has more than one album under her belt. Here’s all you need to know about her bio, age, family, and more. Ever since Soccer Mommy broke into mainstream success, music lovers have been fervently receiving her songs while keeping track of information about personal life. The budding singer was brought up by her parents in Nashville, Tennessee, in the United States but she was born in Switzerland in 1997. However, the exact day and month she arrived in the world is not known. 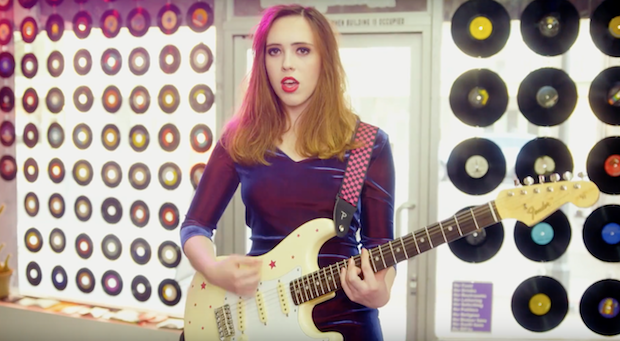 Soccer Mommy developed a keen interest in guitar at the age of six. It was also her love for the fretted musical instrument that promoted her to enroll at a Nashville-based musical specialty high school known as Nashville School of the Arts, where she majored in guitar and featured in the swing band. When it was time for college, the singer decided to further her education at New York University. But before she left for college that year (2015), she recorded some songs at home and posted them to the online music platform, Bandcamp under the name Soccer Mommy. The pop rock singer was later admitted to study music business at the Steinhardt School of Culture, Education, and Human Development. It was while she was in college that she played her first show which took place at the community art space Silent Barn in Bushwick, Brooklyn. After performing as Soccer Mommy at Brooklyn, she was subsequently signed by the record label, Fat Possum. Soccer Mommy spent two years studying music business at the University and later decided to drop out in the year 2017 in order to fully give her music career attention in Nashville. So far, the up-and-coming guitarist/singer has released one album proper and two full-length albums. Her first full-length album titled For Young Hearts was released on Orchid Tapes in 2016 while the second one (titled: Collection) was released on Fat Possum Records in the year 2017. March 2nd, 2018 was the day Soccer Mommy released her first album proper, titled Clean. Soccer Mommy’s family consists of her parents but their names are yet to be publiclized by the singer. Similarly, it’s not clear if she has siblings or not. The singer once mentioned in an interview that the first acoustic guitar she used was bought by her parents and that they’ve been very supportive of her career. Though the singer is basically into Indie rock, she said her father is not super-musical but that he is a big fan of the American rock singer-songwriter, Bruce Springsteen (born Bruce Frederick Joseph Springsteen). 1. Her real name is Sophie Allison. 2. Her favourite television shows are Daria, Buffy [the Vampire Slayer], Sabrina the Teenage Witch, and Charmed. 3. She also loves playing Pokémon on the handheld game console, Gameboy. 4. In addition to guitar, Soccer Mommy can play bass and drums as well. She learned the instruments at rock camp. 5. The singer started getting into the 1990s alt-country during her high school and college years but before that period, she was mainly into rock. 6. Information about the on-the-rise singer’s body measurements, net worth, and relationship status is not open to public scrutiny currently. 7. Renowned American singers Avril Lavigne and Taylor Swift are some of her musical influences.